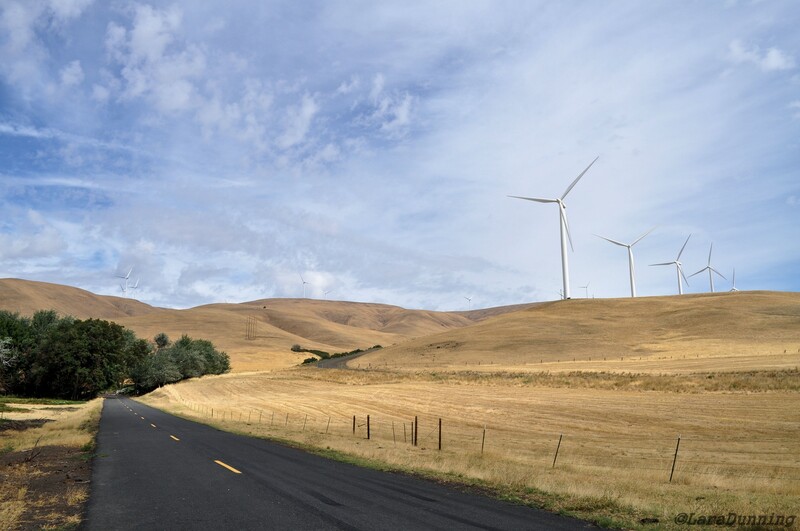 On the surface the small town of Maryhill, Washington might seem like it is only a few intersecting roads that cut through basalt, farmland and cheat grass. But, thanks to Sam Hill and local winemakers it is worth the stop. Maryhill Loops Road is 10 miles long with 25 curves—8 of them hairpin—and an elevation gain of 850 feet with a 5% grade. It took Sam Hill, who was very outspoken about the importance of modern roads in the Northwest, four years to build it at his own expense. When completed he invited the governor and politicians to view this marvel to show them modern roads could be constructed in the Northwest. Admission is free. Pedestrians and bikers can use the road most days from 7 a.m. to 5 p.m. There are only a couple of days a year the road is open to vehicles and posted on the Maryhill Museum of Art website. Each year, the loops are used for Maryhill’s “Festival of Speed,” North America’s largest gravity sports festival. Watch this video to learn more. The Maryhill Museum of Art is in Sam Hill’s former mansion. Its collection of art consists of sculptures, Orthodox icons, royal artifacts and furniture, paintings, Native American objects and much more. The grounds are an artistic treasure, free to explore, and offers stunning views of the Columbia River Gorge. The Museum is open March 15 through November 15, 10 a.m. to 5 p.m. Admission: adults $9, senior $8, children 7-18 $3, family admission $25. Maryhill State Park sits along 4,700-feet of Columbia River waterfront. 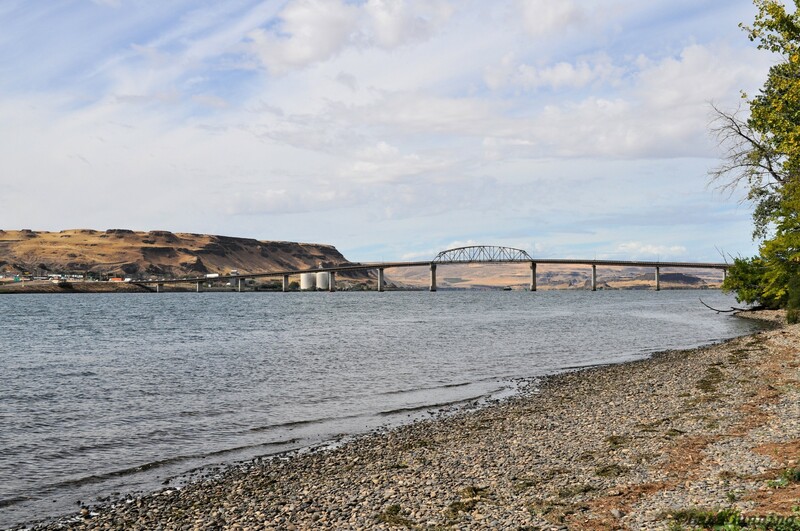 From the park’s two swimming beaches you can see Sam Hill Memorial Bridge (also called the Biggs Rapid Bridge) which connects Washington State and Oregon, and the basaltic cliffs along Oregon. The campground, has 20 tent sites, 50 utility sites, two beaches, a shaded picnic area, a boat launch and a small dock, and makes for a perfect base camp for exploring the area. Keep in mind that that the park is next to a well-used highway and the sounds of night traffic filters into the campground. A day pass or Discover Pass is required to enter any Washington State Park. 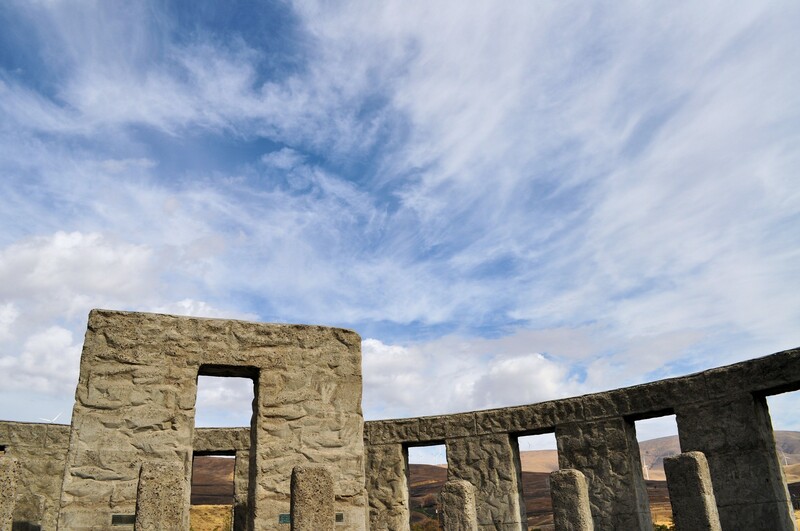 Maryhill Stonehenge is built to the exact dimensions of the original Stonehenge and took 11 years to complete. Sam Hill, the builder of this memorial, dedicated it to the servicemen of Klickitat County who perished in WWI and to serve as a reminder of the sacrifices of war. 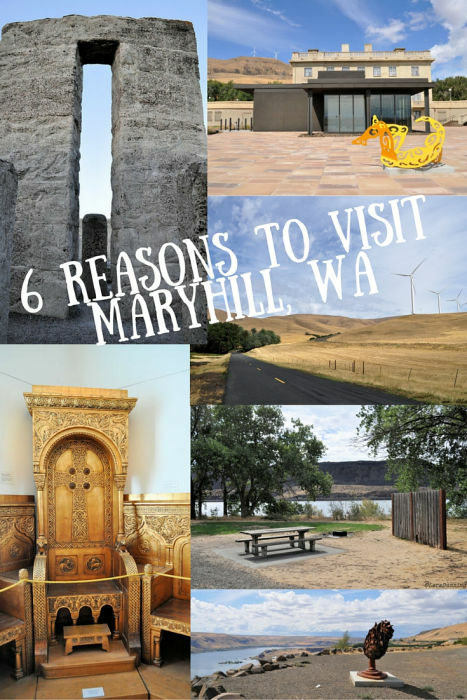 It’s right up the road from the small town of Maryhill, free to visit, and has panoramic views in all directions (think golden hills, Columbia River, and plenty of sky). I’d suggest going in the early morning or late afternoon for dramatic sunrise/sunset photos. Wine Press Northwest named Maryhill Winery the 2015 Pacific Northwest Winery of the Year. The setting of this destination winery is gorgeous with views of the Columbia River and vineyards, a spacious tasting room with a 20-foot bar, a selection of artisan meats and cheeses available for purchase, bocce courts, a picnic area, and a 4,000 seat outdoor amphitheater for summer concerts. Waving Tree Winery is a small family-owned winery that specializes in Italian and Rhone style wines. Their tasting room is in the log cabin near Maryhill State Park. Travel Tip: Seattle is 223 miles and a little under a 4-hour drive away, and Portland is 100 miles and a 2.5-hour drive. Thinking of visiting Maryhill? Find the best deal, compare prices, and read what other travelers have to say at TripAdvisor. I hope to visit Maryhill winery this year. They have concerts in the summer too, which I’ve heard good things about. Whenever I get around to taking a Pacific Northwest road trip from Portland to Seattle, which is very high on my travel wish list, I’ll have to keep Maryhill in mind. 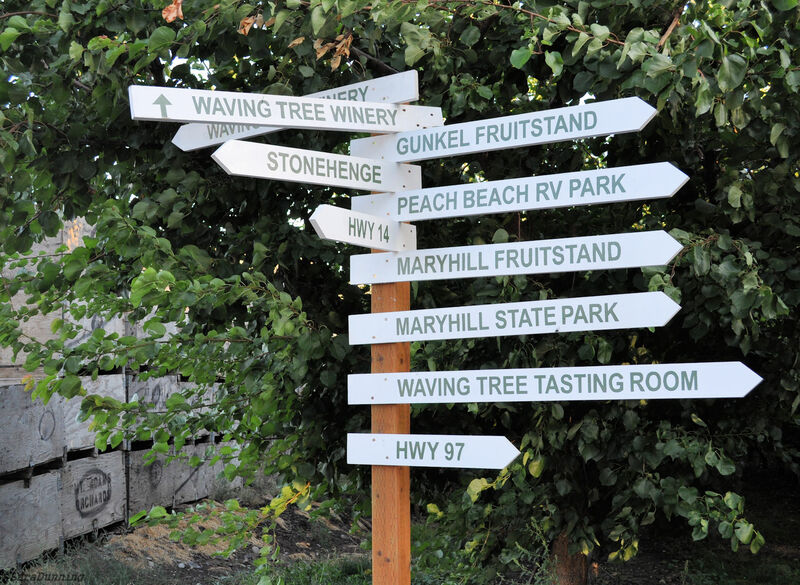 I’d love to visit Maryhill and Waving Tree wineries. That will be a great trip. So many neat things to see, taste and experience. Since I know you like food, I’ve heard the Glass Onion restaurant in Goldendale, which is about 15-20 minutes north of Maryhill, is really good. 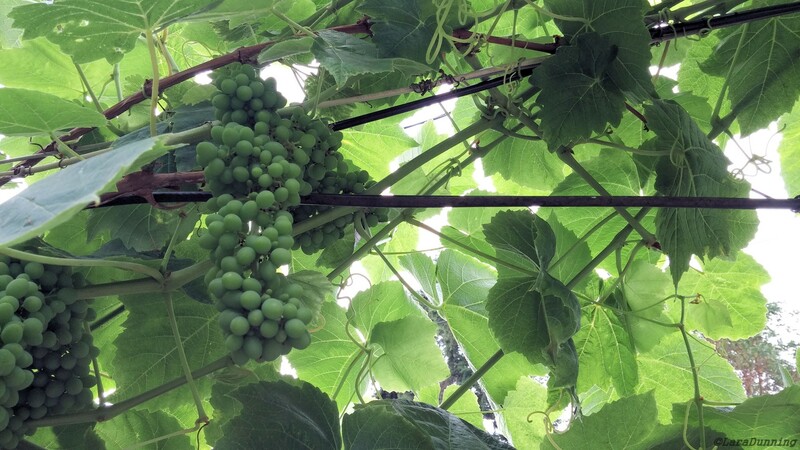 Victoria, Wine tours are always a good thing. If only it were a bit closer to Seattle, I’d do it without a second thought next time I’m there! Yes, it is quite a drive from Seattle, but if you drive along the Columbia River it is an amazing view. If you get the chance its worth the drive. The drive itself is amazing too. That Sam Hill sounds like a fascinating person between the road and Stonehenge. Thanks for a little bit of history of this area. Tonya, I didn’t realize how important he was to the Pacific Northwest until I went there. A big eye opener for sure. Good old hairpin turns 😉 Looks like some great places to stop, I’d definitely be interested in the wineries if qwerty are in that area! Amy, Thanks so much for commenting! 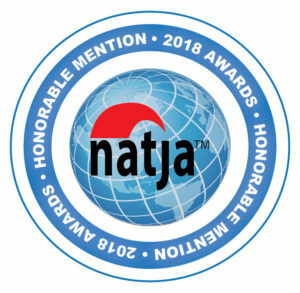 and happy to help put some wineries on your radar. Lara, I really like how you can make any small town in Washington an interesting one! I’ve driven through that area, and I do love the contrast between the golden hills and the blue expanse of sky. And the river! Such a simply beautiful area. Next time I’m driving through, I’ll have to be sure to stop! Tami, Every time I drive through Eastern Washington I’m just blown away by the landscape and endless sky. Sounds like we are on the same page with appreciating nature’s endless beauty. Yes! Stop at Stonehenge next time. You won’t be disappointed! Michelle, I would love to see that clock and learn about its meaning to the town! How fun! I have not had the pleasure of exploring that part of the country. Stonehenge? What unexpected fun! There is a small version in the small town of Hunt, Texas I’ve seen. Natalie, I’d love to see the one in Texas. A small town there used to have a replica of the Forbidden City, but I heard its no longer there. C and D, Glad you found this helpful. The Pacific Northwest is an amazing part of the US. I hope you get to visit soon. These are indeed compelling reasons to visit Maryhill. I am particulary interested in the Maryhill Loops road, the Museum and Maryland Stonhenge. Vyjay, One of these days I want to walk the loops road. Wow such beautiful scenery. Looks like a great place to unwind. I would love to go to that museum. Holly, I really enjoyed our visit to the museum and you are right the area is peaceful and if you just want to visit the local sites a great place to unwind stress-free. It does look like a nice place for relaxation. People should spend their money on developments like this instead of casinos. Jem, It’s a little bit of something in the middle of nowhere. It’s nice that Sam Hill left behind some places for us to enjoy. Stonehenge in Maryhill…that’s just the sort of quirkiness I’ll go out of my way for! And a winery? Double bonus. Making a note to seek it out next time we’re in Washington state. Rob and Ann, I like quirky things too. Glad I could help you find a fun stop, and I agree the winery is a huge bonus. You really are finding some great places Lara. I would love to do this, especially the wine tours, and I would love to camp there as well. Kerri, I’m glad you are finding this helpful. Thanks so much for commenting! I love sculpture parks so I think the Museum of Art would suit my fancy! Natasha, You’d really like the grounds and sculptures, which are all free to view. 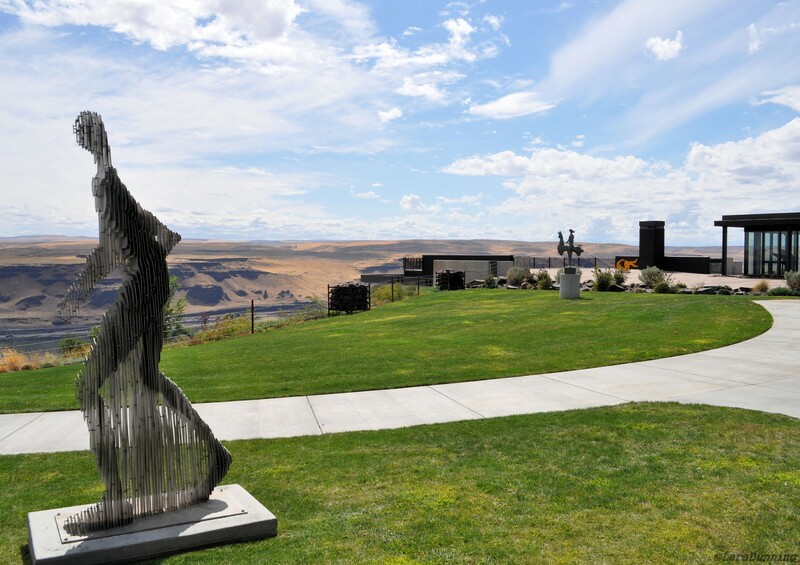 Set against the Columbia Gorge makes for some dramatic viewing of art and nature. Crystal, For being in the middle of nowhere its got quite a few attractions. It’s nice to be surprised by those finds when traveling. Sounds like a very interesting place to visit. That road sounds epic to drive on, it sounds a lot like the Transfagarasan highway in Romania! Nic, I wish they opened that road to the public a few times a year. I’d totally drive it even tho I’m prone to getting carsick. I’ll have to check out the highway you mention in Romania. All great reasons to visit and there’s also a wonderful fruit stand near the river on the road down from the Museum. Elaine, I’ll have to check out the fruit stand next time I’m there. You have convinced me, Lara! Too cool to know there is a second Stonehenge in the world! Elisa, Thanks for sharing the love of the second Stonehenge. Can’t be no crowds and amazing views. There’s a stonehenge in WA?! And it’s near a winery?! I’m sold!